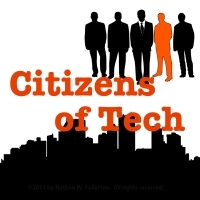 Citizens of Tech Podcast Has Re-Launched! My friend Eric Sutphen and I started the Citizens of Tech podcast using some spare capacity on the Packet Pushers platform to see what folks thought of the idea. We received lots of positive comments from the audience. Several of you stated that Citizens of Tech quickly became one of your “must listen” shows. If you have no idea what Citizens of Tech is about, it’s a free, entertaining podcast about tech of the past, present, and future that doesn’t skimp on the nerdy details. If you like Packet Pushers, you’ll probably like Citizens of Tech, although it’s not a show about enterprise IT. Read more about it here. Follow us to the new site. Subscribe to the new RSS feed in your favorite podcatcher (iTunes users, subscribe here). Enjoy the new content, including Show 13 – Extreme Font Hypermiling released on 18-Sept-2015. We have already recorded and produced show 14 (coming out next week), and shows 15 and 16 are well underway!